Professor of Genetics and Stem cell Research, Dr. A.P.J Abdul Kalam Education & Research Centre, Mumbai, India. Cancer is one of the most common leading cause of death in men and women worldwide. Most of the cancers are diagnosed at the last stage. Therefore, clinicians find difficulty in giving treatment to these patients which resulted in an overall high mortality rate in cancer patients. Radiation therapy or chemotherapy is the major treatment for most of the cancers. However, due to severe side effects, most of the cancer patients stumble to death. Immunotherapy is an alternative innovative therapy for cancer, which uses cancer patient’s own body cells to stimulate their own immune system to kill cancer cells. There are different types of immunotherapies such as treatment of cancer patients with monoclonal antibodies, cancer vaccine, immune-check points inhibitors and Chimeric Antigen Receptor (CAR)-T cell therapies. CAR T-cell therapy is one of the promising therapies, where immune T cells are modified in the lab in such a way that they can destroy cancer cells alone leaving normal cells live. Few CAR T-cell therapies are approved for use in the treatment of advanced leukemia and lymphomas. CAR T-cell therapies are only being used in clinical trials for those patients who are not responding to conventional therapy. In 2018, Professor James Allison from M.D. Anderson Cancer Centre, Texas, USA, received the Noble prize for his outstanding contribution in the field of immunotherapy of cancer. Since then, there is great excitement in the field immunotherapy of cancer. 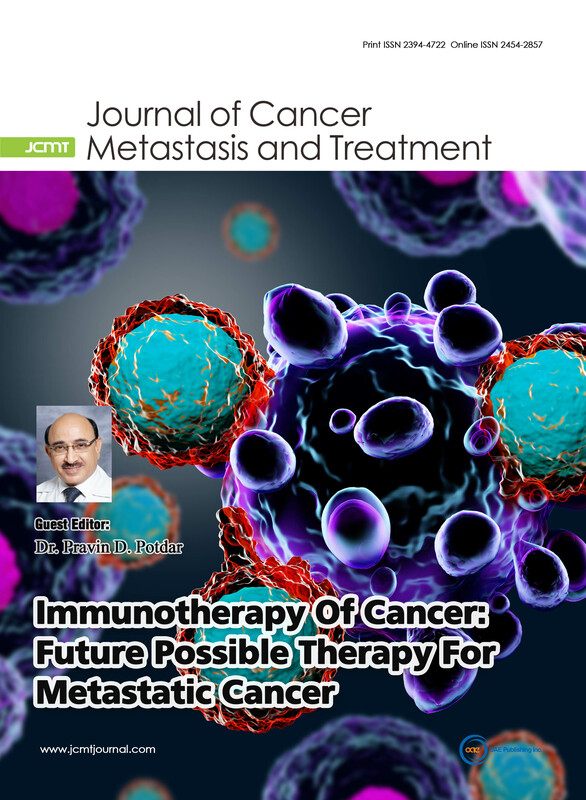 Therefore, the Journal of Cancer Metastasis and Treatment (JCMT) has the great privilege to introduce this important hot topic for their readers through this special issue on “Immunotherapy of Cancer - Future Possible Therapy for Metastatic Cancer.” This issue will address important technical and theoretical aspects of the development of immunotherapy for various cancers. This special issue will also emphasize its early clinical drug development, clinical trials, translational research, therapeutic effectiveness and successful management for the treatment of cancer patients. This special issue will be a great asset and reference book for young cancer researchers, who are beginning their research on these novel therapies of cancer.